A new generation of tech-savvy and connected students arrives with radically different experiences and expectations. Aware of the global economy and the competition it represents, students and their families are placing increasingly higher demands on education at all levels. 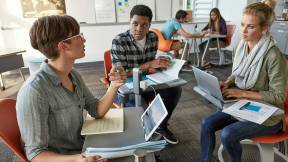 Educators are responding with a refreshing openness, evolving teaching methods, incorporating technologies and looking for ways to promote active learning in more places. Active learning is fluid and dynamic. The space in which it takes place should be flexible as well. 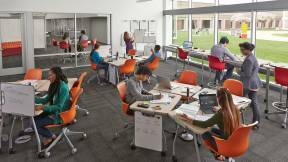 Yet, the majority of classrooms and lecture halls were built as traditional passive-learning settings with inflexible and immobile furniture that can inhibit interactions between students, instructors and content. 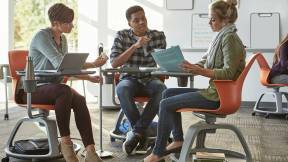 Many of these outdated classrooms aren’t capable of supporting the varied technologies, activities, and mode-to-mode transitions necessary for today’s active learning environments. Interested in learning more about our Verb Active Media Table? 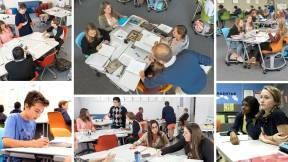 Sign-up to receive more updates and insights from Steelcase Education. To reach this goal, educators realized they needed to transition from traditional classroom and lecture hall approaches. The central question was: How can a large classroom support both active learning and lecture-driven instruction while effectively integrating technology? 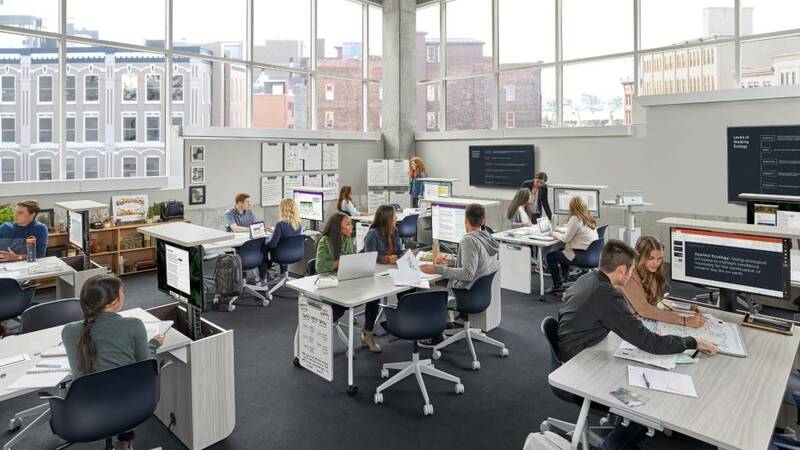 Together, the university and Steelcase Education worked to create a classroom solution that will amplify collaboration, engage students and simultaneously resolve technological obstructions. 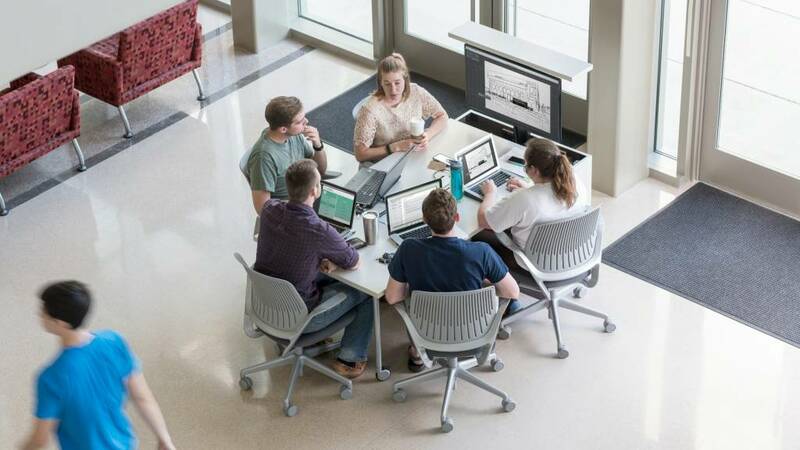 The table created for the university is mobile for flexible classroom setup, offers access to power for a variety of devices and hosts a 32-inch monitor with an automatic monitor lift. 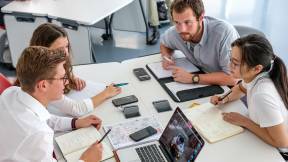 The classroom table facilitates technological needs, improved sightlines, and increased student engagement with professors, peers and content. 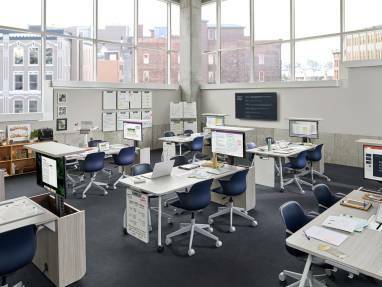 Inspired by the needs of many other schools to implement active learning at a larger scale, Steelcase Education has since taken the insights gained from the Texas A&M collaboration and applied them to develop new components to the Verb collection of classroom furniture including the Verb Active Media Table. 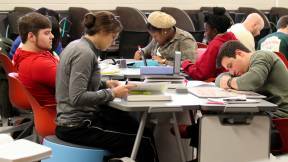 The new Verb Active Media Table builds on the Texas A&M requirements to offer additional benefits to education spaces of any size. It includes a pendant to raise and lower the monitor, an integrated wire manager and analog whiteboard storage. It maintains the ability to host a 32-inch monitor, but also offers the capacity to host a 42-inch monitor. 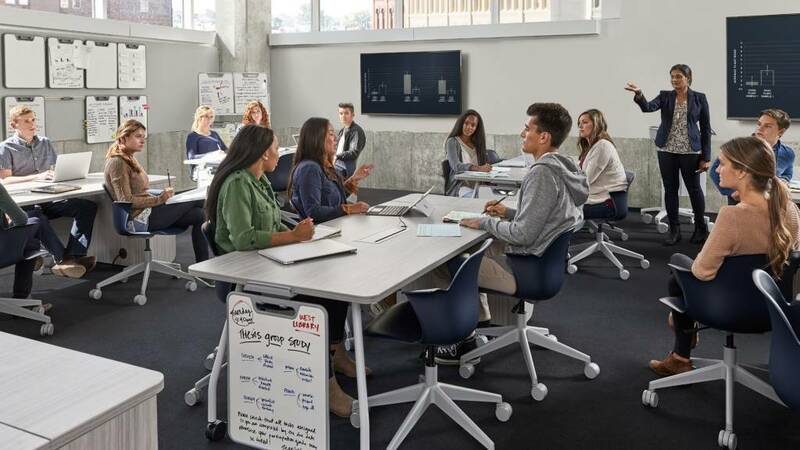 This table implements the same versatile technology support for idea-sharing, allowing for mobility and durability to withstand a variety of education environments. The automatic monitor lift eliminates the need to mount technology to a wall or column, offering clear sightlines and providing quick transitions between learning modes. 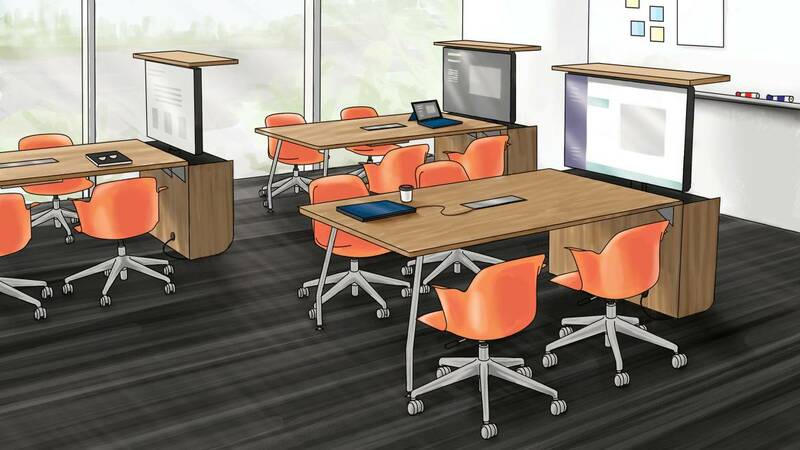 Housing built-in, retractable media within this table bridges the gap between students and content, and optimizes student engagement. 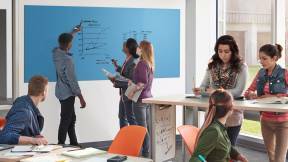 Discover how Steelcase Education and Texas A&M worked together to bring active learning to large classrooms. 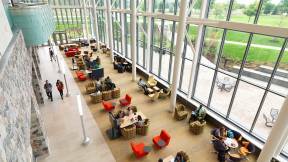 Tylee Bush is a Brand Communications Intern at Steelcase. She contributes content as well as works on media coverage and brand management. Tylee is also a student at Grand Valley State University pursuing a Bachelors in Communication Studies paired with a minor in Writing. She has published work on various news, business and social platforms. 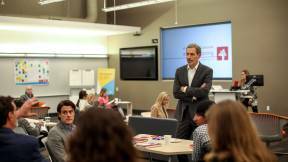 How one university is using Steelcase Education classrooms to prepare students for a rapidly changing world. 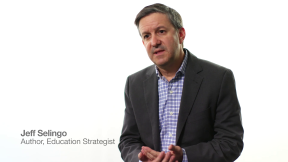 Author, professor and visiting scholar, Jeff Selingo, shares his vision for the future of learning. 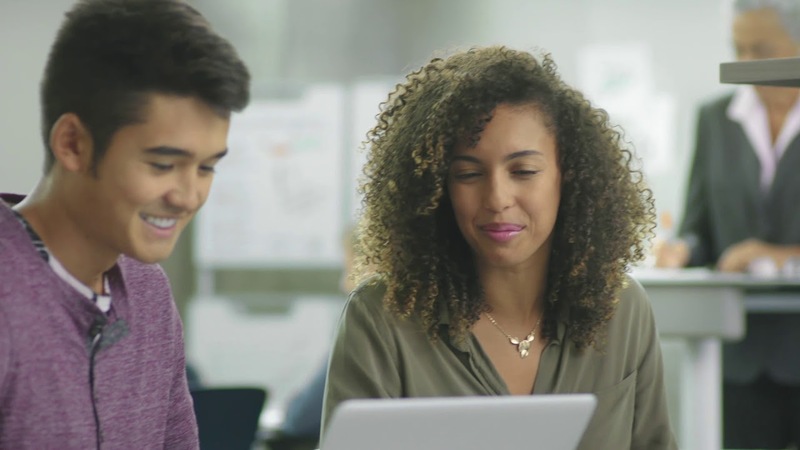 Explore how job and technology trends will make place more important than ever. 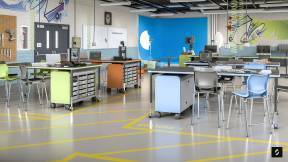 Smith System manufactures high quality furniture for pre-K-12 education spaces designed to inspire better learning and improve outcomes for students.